Robert Jeffress – pastor of First Baptist Church in Dallas – was chosen by President Trump to give the opening prayer at the recent opening ceremony for the U.S. Embassy in Jerusalem. Robert Jeffress says “You can’t be saved by being a Jew,” and “Mormonism is a heresy… He’s said the same thing about Islam. Such a religious bigot should not be giving the prayer that opens United States Embassy in Jerusalem. Robert Jeffress shares ideas and reasons to support the evangelical Christian doctrine that salvation for all of mankind – for Jews, Mormons, atheists, Muslims, Hindus, agnostics, etc.—comes by grace alone, through faith alone and trust alone in the substitutionary death of Christ on the cross … and His subsequent bodily resurrection from the dead. 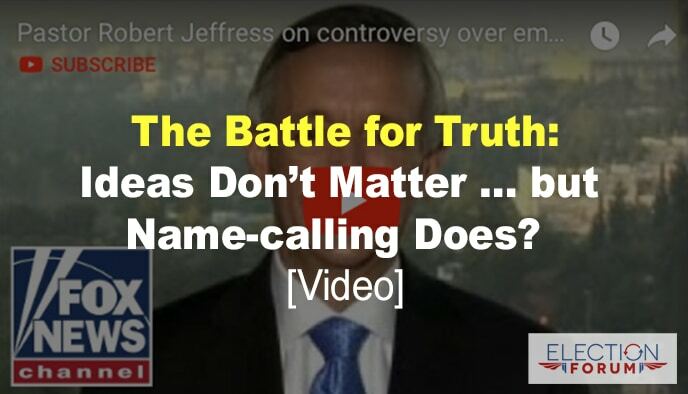 Mitt Romney on the other hand gives no ideas or arguments … he simply calls Jeffress a name – a religious bigot. Does he mean he believes Jeffress is intolerant of people who disagree with his religious beliefs? If so, he has a point … but he gives no reasons or arguments to support the idea that Jeffress is intolerant of other people. If, on the other hand Romney – by calling him a religious bigot – means that Jeffress is intolerant of religious beliefs that contradict his own faith … Romney has no leg to stand on. All religions teach that their doctrines are true, and that contradictory religions and doctrines are false. Romney himself believes this about his religion … whether he’s willing to admit or not. So, Romney is just as much of a religious bigot as he accuses Jeffress of being. You made a good point. But who started? Mitt Romney started with this kind of mockery and Jeffrey’s response is right on! Belief alone is not good enough! You must be a doer & live a truly righteous life. Jesus calls for a true follower to be a full disciple. Christians were called that because they lived so much like Jesus did. Are you doing that? We must work out our salvation with fear & trembling. Those that make it do so by much suffering & tribulation. Tbose who endure to the end get saved, not because you say I BELIEVE. As a believing Jew, I find that most of the Jews who have trouble with Christian beliefs are usually the least knowledgeable and least concerned about Jewish values and beliefs and can only define their Jewishness by a perceived anti Semitism supposedly promoted by believing Christians. I personally cannot stand secular humanist Jews, they believe in almost nothing. All of my friends and family are Orthodox Jews, we love HaShem, we love Trump, we adore America, and we have the greatest respect for believing Christians who both believe in their Faith and also practice it, especially the part about loving your neighbor. I am 68 years old, dying of cancer, living and loving it in Israel for 35 years, and most of all, my closeness to HaShem here in the Holy Land of Israel has done a lot to keep me alive and in the arms of my loving family. God bless you, guide you, and keep your faith strong, it will be believing Christians like you who will save America and the rest of the Judeo/Christian West. KEN you said it beautifully!!!!! Hey Robert! Good point, but consider the rich young ruler coming to Jesus asking for eternal life. He received Him or he would not have sought Him & he believed in the name of Jesus, their Messiah, who could tell him how go get eternal life from God. Jesus even recognized all tbe Jewish laws & traditions he was doing but then Jesus offerred him eternal life that he didn’t have even though he was a Jew of Jews. Jesus told him 3 things. (1) sell everything, (2) Give all the money to the poor (3) & the most important, come & join Jesus’ disciples & follow Jesus. What did he choose to do? Having received & believed in certain parts of Jesus, he would not obey Jesus. There are millions of so-called believers, who go to cburch & do all the Cbristian activities (I know as I was a Christian Pharisee minister for decades) but don’t’ follow as Jesus said to. I know, I pastored many of tbem besides being one myself. But Jesus has asked me over 2 times to get ride of all my belongings when single & married with children & follow Jesus to a new place & lifestyle. I know these things as as I have experience living them in my nearly 50 years as a minister starting churchs & doing city-wide crusades from CA to AK to Wash, D.C. Being a mental believer & doing Christian traditions is one thing but obtaining eternal life is another. Who gets saved are those who forsake everything, pick up their cross of suffering & follow & endure to the end are saved. Casual, carnal Christians, the lukewarm ones are not saved but God spits them out of His mouth. May that not happen to you. Check yourself! Excellent article, well said. Thank you and praise the God and Father of our Lord Jesus Christ. Jeffress endorsed Trump at a point during the primary when neither Trump’s past behavior and lifestyle nor his campaign conduct favored taking seriously any claim he made to Christian belief or good character. Surely a “religious bigot” would not have done this. Though I still think Jeffress misused his pastoral office when he gave Trump that early endorsement, it must be granted that he proved by it that he is no religious bigot. I fear that Romney’s opposition to Trump has led his conservative friends to shun him, so that he now receives counsel from silly all-paths-lead-to-God liberals. If you’re one of the conservatives who has withdrawn his good counsel from Romney, please consider getting back in touch with him. I pray it is not too late.